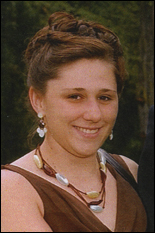 Family and friends of a Gemstone alumna have established the Sarah E. Gingrich Firebaugh Memorial Scholarship with a gift of $63,000 to provide annual scholarships to juniors and seniors in the Gemstone program. The first award will be provided in the 2008-2009 academic year. The scholarship will go to a well-rounded student in the Gemstone program majoring in engineering, chemistry, biochemistry or physics. Preference will be given to Pennsylvania residents. Firebaugh, B.S. '00, chemistry, was among the first students to participate in the Gemstone program, which provided her the opportunity to research Chesapeake Bay pollution. In addition, she sang with an a capella group on campus and was president of the UM chapter of Habitat for Humanity. She died in a car accident in 2007. "Sarah was loved and she will be missed," her family said in a statement. "It is in this spirit that her family and friends have come together to honor her memory through the creation of this endowment and scholarship."